Synergetic helps its customers to design and manufacture plastic injection molds using Plastics flow simulation software. 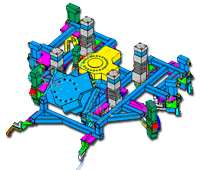 Complex and multi-cavity injection molds are designed by our engineers using various modules of plastics flow simulation software to simulate the filling, packing and cooling phases of the injection molding process and to predict the flow behavior of thermoplastic melts so that our customers can ensure parts of acceptable quality are manufactured efficiently. Synergetic’s experience in Tool Design gives us a unique position in the Engineering Services industry and with our collective experience in designing various Dies for Sheet metal parts; we are often the obvious choice for our clients.